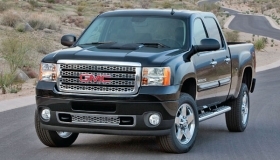 Sales of the GMC Sierra climbed 27 percent last month, nearly double the industry's increase. DETROIT -- If there's a bright spot in June's tepid light-vehicle sales, it came from an unlikely segment. After slumping for several years as the economy tanked and gas prices spiked, pickup demand is rising faster than the overall sales gains of most automakers -- serving as a pillar once again during the industry's fledgling recovery. And most of the buyers returning to showrooms are pickup enthusiasts, automakers say. For the year, Ford's truck sales are up 33 percent -- ahead of the gains posted by the company's cars and SUVs. Sales of the 2011 F-Series Super Duty surged 58 percent last month, and F-150 demand climbed 29 percent while the U.S. industry overall advanced 14 percent. In June, sales of General Motors Co.'s biggest pickups – the Chevrolet Silverado and GMC Sierra -- advanced more than 25 percent. They are up 11 percent for the year. Demand for the Nissan Titan climbed 24 percent last month and is up 26 percent for the year. At Toyota Motor Corp.'s Toyota Division, light-truck sales have climbed 17 percent this year. Tundra pickup sales surged 49 percent last month and are up 26 percent for the year. Steve Carlisle, GM's vice president for global product planning, said several factors are pushing pickup sales higher. But Ford sales analyst George Pipas said the automaker doesn't expect the pickup market to provide a sustainable boost for the industry until the housing market improves. Still, discounts and offers of 0 percent financing seem to be drawing buyers once again. GM also has seen an increase in pickup share because the automaker has offered enough incentives to bring its pricing in line with those of competitors, Carlisle said. In recent months, GM's pickup share has risen to about 40 percent, Carlisle said. Company spokesman Tom Henderson could not immediately provide the GM's share from April or May for comparison. Still, GM's incentives of pickups last month appeared higher than those of their top competitor, the Ford F-150. In June, the average incentive load on a Silverado 1500 was $5,415, compared with $4,016 on an F-150, according to consumer auto site Edmunds.com. Henderson said measuring incentives is complicated and declined to provide additional incentive information.